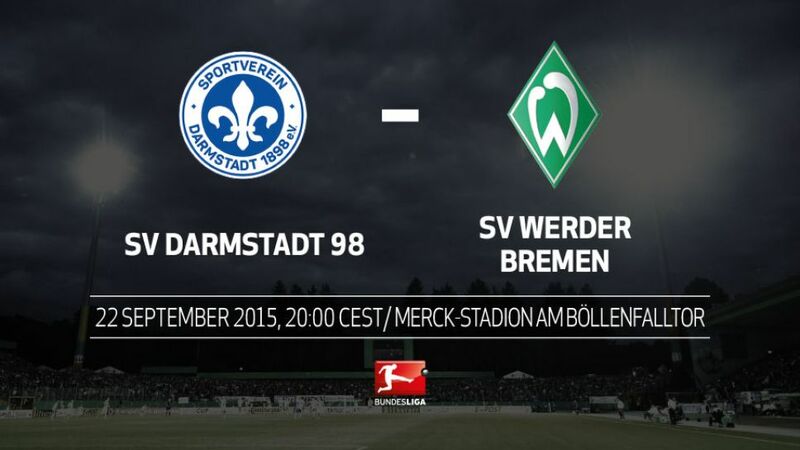 Darmstadt - SV Werder Bremen will hope to emulate FC Bayern München on Tuesday and win at the Stadion am Böllenfalltor where only the reigning Bundesliga champions have beaten SV Darmstadt 98 recently (kick-off 20:00 CEST / 18:00GMT). Darmstadt's 3-0 loss to Bayern was their first Bundesliga defeat in 33 years.Darmstadt conceded as many goals in that match as they had in their opening four games.Bayern were the first team to win at the Stadion am Böllenfalltor in 15 competitive fixtures. It was Darmstadt's first home defeat since early October 2014.Darmstadt's highest Bundesliga win came against Bremen when they triumphed 3-0 on 26 May 1979.These two teams last faced each other in the second round of the DFB Cup on 21 November 1984, a tie won by Bremen.Bremen have registered four points from their opening two away matches of the campaign, the first time they have done that in six years. Their two defeats this season have come at home.